Across five centuries and half the globe comes this concise guidebook of essential spiritual teachings. How to choose a guru, how to practice yoga, even where to live—you'll find it all in this invaluable work originally written in Sanskrit by Rupa Goswami, the greatest spiritual genius of medieval India. Translated and illuminated by Rupa Goswami's modern successor, Srila Prabhupada, The Nectar of Instruction is the key to enlightenment for all seekers on the path of spiritual perfection. Narrated by Amal Bhakta Dasa. Approximately 3 hours and 43 minutes. Slight imperfections have occurred during the transfer from the original cassettes to digital. There are six principles favorable to the execution of pure devotional service: (1) being enthusiastic, (2) endeavoring with confidence, (3) being patient, (4) acting according to regulative principles [such as shravanam kirtanam vishnoh smaranam [Bhag. 7.5.23—hearing, chanting and remembering Krishna], (5) abandoning the association of nondevotees, and (6) following in the footsteps of the previous acharyas. These six principles undoubtedly assure the complete success of pure devotional service. …One should accept this opportunity to return home, back to Godhead, very enthusiastically. Without enthusiasm, one cannot be successful. Even in the material world one has to be very enthusiastic in his particular field of activity in order to become successful. A student, businessman, artist or anyone else who wants success in his line must be enthusiastic. Similarly, one has to be very enthusiastic in devotional service. Enthusiasm means action, but action for whom? The answer is that one should always act for Krishna—krishnarthakhila-ceshta (Bhakti-rasamrita-sindhu). 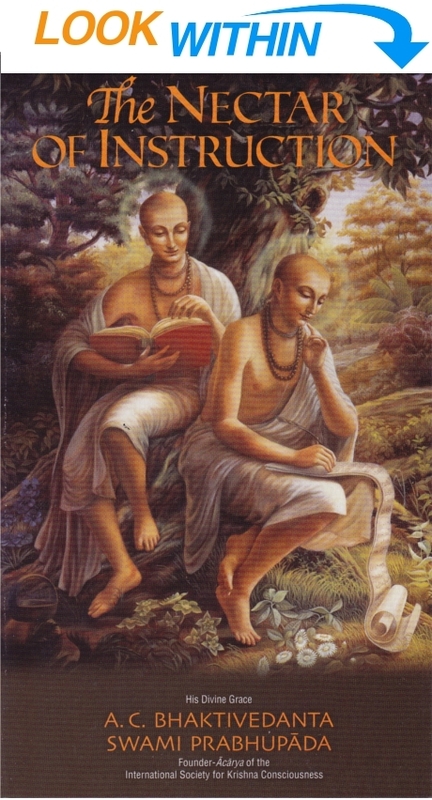 …If one strictly follows the advice given in this verse by Srila Rupa Goswami—namely, being enthusiastic, being confident, being patient, giving up the association of unwanted persons, following the regulative principles and remaining in the association of devotees—one is sure to advance in devotional service. …Devotional service is so pure and perfect that once having begun, one is forcibly dragged to ultimate success. Sometimes a person will give up his ordinary material engagements and out of sentiment take shelter of the lotus feet of the Supreme Lord and thus begin the preliminary execution of devotional service. Even if such an immature devotee falls down, there is no loss on his part. On the other hand, what is the gain of one who executes the prescribed duties according to his varna and ashrama but does not take to devotional service? Although a fallen devotee may take his next birth in a low family, his devotional service will nonetheless resume from where it left off. Devotional service is ahaituky apratihata; it is not the effect of any mundane cause, nor can it be terminated by any mundane cause or permanently curtailed by any material interruption. Therefore a devotee should be confident about his engagement and should not be very interested in the activities of the karmis, jnanis and yogis. “When I am eager to understand the literature given by the Goswamis, then I shall be able to understand the transcendental loving affairs of Radha and Krishna.” Sri Chaitanya Mahaprabhu appeared in order to bestow upon human society the benediction of the science of Krishna. The most exalted of all the activities of Lord Krishna are His pastimes of conjugal love with the gopis. Sri Chaitanya Mahaprabhu appeared in the mood of Srimati Radharani, the best of the gopis. Therefore, to understand the mission of Lord Sri Chaitanya Mahaprabhu and follow in His footsteps, one must very seriously follow in the footsteps of the six Goswamis—Sri Rupa, Sanatana, Bhatta Raghunatha, Sri Jiva, Gopala Bhatta and Dasa Raghunatha. Sri Rupa Goswami was the leader of all the Goswamis, and to guide our activities he gave us this Upadeshamrita (The Nectar of Instruction) to follow. As Sri Chaitanya Mahaprabhu left behind Him the eight verses known as Sikshashtaka, Rupa Goswami gave us Upadeshamrita so that we may become pure Vaishnavas. In all spiritual affairs, one’s first duty is to control his mind and senses. Unless one controls his mind and senses, one cannot make any advancement in spiritual life. Everyone within this material world is engrossed in the modes of passion and ignorance. One must promote himself to the platform of goodness, sattva-guna, by following the instructions of Rupa Goswami, and then everything concerning how to make further progress will be revealed. Advancement in Krishna consciousness depends on the attitude of the follower. A follower of the Krishna consciousness movement should become a perfect Goswami. Vaishnavas are generally known as Goswamis. In Vrindavana, this is the title by which the director of each temple is known. One who wants to become a perfect devotee of Krishna must become a Goswami. Go means “the senses,” and swami means “the master.” Unless one controls his senses and mind, one cannot become a Goswami. To achieve the highest success in life by becoming a Goswami and then a pure devotee of the Lord, one must follow the instructions known as Upadeshamrita, which have been given by Srila Rupa Goswami. Srila Rupa Goswami has given many other books, such as Bhakti-rasamrita-sindhu, Vidagdha-madhava and Lalita-madhava, but Upadeshamrita constitutes the first instructions for neophyte devotees. One should follow these instructions very strictly. Then it will be easier to make one’s life successful. Hare Krishna.